Let’s begin with the sound. You remember it from the time when you were young, how it rang out in the streets in springtime, at about the same time as the last patches of snow were melting and clayey lawns were reappearing, pitiful and muddy-brown. It was then the schools’ bands came. Around the same time as everyone started wearing thin shoes again, strangely light after the winter months. And, with these light shoes on, you couldn’t stop yourself walking behind the marching band when it came into your street with its solid brass sound and the sharp rattle of the drums, with its uniforms and medals and emblems and banners and tassels and badges and baubles and all the rest of its gear, your shoes tripped along, automatically in time with the music – one, two, one, two – and where your shoes went, you simply had to follow, you had no choice, you flew while you walked. This was the real sign of spring in a pale April, the audible mark on the calendar stick of post-war Norway, the prologue to summer, the schools’ marching bands, the foretaste of 17th May, Norway’s Constitution Day. When you are a child you do not reflect on your experiences, you are in them. The sound of the Valdres March seemed loud enough to fill the huge space between Grorudåsen hill and Furusetåsen hill, yes, even further afield you could hear the bands rehearsing their music while rehearsing their marching. Many people would intuitively say that this, the sound of the schools’ bands, is the true sound of Norway. The novelist Agnar Mykle has perhaps put it more eloquently in his novel Lasso Around the Moon (1954) when he calls it “the sound of gold and of freedom”. A marching band is in its right element when it plays out of doors. If you happen to hear it play indoors, whether it be in a gymnasium – forced there, perhaps, by pouring rain on 17th May – or in a more dignified concert hall, you immediately notice that something is wrong, that the sound of this sort of band is fashioned to be heard in the open air. It threatens to blow down walls and roofs: it wants to burst out, and to reach as far as it possibly can. It is military music, or, to use a more elegant term, martial music. It was originally suited not just to inspire the feet of young lads to march with enthusiasm in time with spring, but also to scare enemies and to impress civilians. So it sounds best when it is given full rein. This is why recordings of marching music are often so unsatisfactory to listen to, for the sound technicians want full control – understandably enough, for this is, after all, what they are there for – and to get full control the first thing they need is a studio. But a studio or other confined space is all too often like a narrow street, down which the band is marching, which causes listeners’ ears to tremble like the houses’ walls, bombarded and overwhelmed by a massive sonic attack where all details and all melodic lines from instruments’ voices are jumbled together – a gigantic pincushion of piercing, bristling, obtrusive acoustic onslaughts. A recording is always very different from the experience of a live performance. The recording of music is today all about setting down something that is perfect and flawless. It is all about having control of the sonic picture itself, of bringing out each line and voice clearly, but also balanced with everything else, to coalesce into a new and almost unnaturally “correct” whole, a whole that can hardly ever be experienced during a live performance. This is the sound producer’s job, and this is where things often go wrong. For while there are always slips, big or small, in a live performance, and while the sound will not always reach your ears perfectly balanced, there is something else on offer: the character and mood of the actual performance. It is a question of being on the spot there and then; the emotional backdrop might be provided by an April sky or an expectant audience in a dimmed concert hall. Or by a guards parade or the Staff Band of the Norwegian Armed Forces marching up Oslo’s principal street with the meticulous precision of a clock’s second hand, and filling the centre of the city with the sound of gold, in rain or in sunshine. Recorded music is completely different. It is dispatched all over the world to an unknown number of people who listen to it in completely different circumstances; it must therefore attempt to disseminate what are the chief features of the piece, seeking objectivity, almost a distilled neutrality. Here lies the danger that the result will be impersonal and bland. That it ends up, in fact, distilled, cleansed of true musicianship, and doubly cleansed of characterful sound, or with a sound that is very different from what the music really asks for. 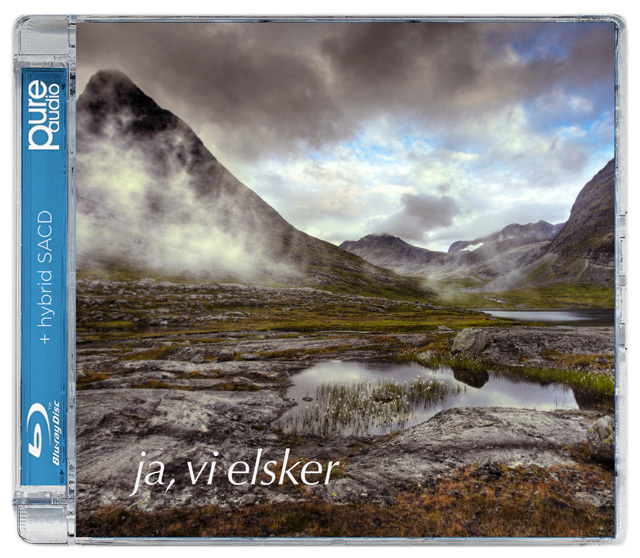 In these performances of some of our best-known and most important Norwegian marches and melodies it is not just that a marvellously good band meets a marvellously good choir, for their music-making and their obvious joy in performing have also been exceptionally well captured on disc. For this we must be grateful both to the inspiring artistic direction of Ingar Bergby and Tone Bianca S. Dahl and to the highly qualified musicians of the Norwegian Armed Forces Staff Band and singers of Schola Cantorum. No less important is the fact that Morten Lindberg has used his ability to analyse and identify what is characteristic for this music as a live performance, then has looked for the technical solutions, before making a synthesis, in which all the elements in the artificial sound-picture are reassembled to create a sonic effect which makes you feel you are listening to the music as it should sound. Of course, the full open-air effect cannot be recreated, but the sonorities are airy and open, and less massive and congested that you often hear in recorded music for bands and other ensembles where the brass sections are prominent. The idea of combining choir and band is, while not new, unquestionably unorthodox. It is challenging, because acoustically choir and band are not necessarily the best of friends. But here the human voice and the instruments of the band meet in a golden equilibrium. To include the songs and their words is necessary because both the songs’ texts and the melodies are programmatic. We must now move on from discussing sound to a discussion of the actual content of the music. This is Norwegian music, national music, strongly patriotic – some would call it nationalistic. At the same time, it is full of beautiful winning melodies. In addition to any special ceremonial function they might have, the melodies also have a programme, a varied ideological ballast, such as in the songs Fagert er landet (Beautiful is the Land), Kronprins Olavs Honnørmarsch (Crown Prince Olav’s March) or Norge i rødt, hvitt og blått (Norway in Red, White and Blue). This content has an overriding purpose: to contribute to the building of the nation. Today it may be difficult to connect with the melodies and words, and to appreciate their meaning and relevance for us. They unquestionably have their origin in a time when most people’s idea of nationality and of their country’s national identity was less fraught and more innocent than today. For while Norwegians probably wave their flags with a more abandoned naivety than other nationalities, the fact is that we live in a world which, not without reason, looks on “nationalism” with strong scepticism. We admit that the “national” is important for our identity, yet this is a somewhat banal concept. The assertion that the “national” is important for our “identity” is an assertion so common that it has become somewhat banal. Equally banal is the common assertion that we all have some kind of immediate access to the «national», yet we seem to regard the external marks of national identity with indifference, scepticism or with a sense of irony. Indeed, the very word “nationalism” has accrued negative associations of intolerance and destructiveness. This is being written in 2014, the year of our celebration of the 200th anniversary of our Constitution. It is revealing that we call it just that: “our Constitution”. The small country of Norway can be proud of its Constitution – in the world beyond, the only country with an older constitution that is still valid and in use is the USA. Norway was in a difficult situation in 1814. The pressure the great powers put on disaffected Norwegians to accept the terms of the treaty of Kiel (January, 1814), which would place Norway firmly in the hands of Sweden, was massive. The Constitution, in its later form that accommodated union with Sweden, did, however, secure for Norway a relationship to Sweden which was very different from what we would have achieved without it, and this sowed the seed for the movement for full independence that came to fruition in 1905. While the “senior partner” Sweden was still constitutionally at the stage of enlightened despotism, Norway, the junior partner in the union, paradoxically enjoyed by far the more enlightened constitution of the two. This is familiar history, but it bears repetition. Indeed, that is precisely what we do, every 17th May, when we greet each other on this, our “national birthday”, when we march behind schools bands in parades large or small, when we make speeches and listen to speeches and doze while other people are making speeches, when we gather with friends and enjoy a festive dinner– in all these things we are indulging in repetition; we are reaffirming something. This is not just a rite with its exterior symbols and its flags and colours and, not least, its music – there is also a content we reaffirm in all this; it is a history lesson. We celebrate our Constitution, and do it more categorically than most others, and not just its conception, but its whole history. We celebrate what this Constitution of ours has meant to Norwegians through two centuries. to my father’s modest hut. He says that’s where he’s free. Norway was a poor country. This is a historical truth it is worth reminding ourselves of, especially in the context of today’s boundless and rather self-satisfied affluence. Most people lived, literally, in huts. There were very few castles and large houses. There was very little external wealth and prosperity, and few buildings of any splendour, and few towns built along grandiose plans, no Michelangelo, Goethe or Beethoven, no long or glorious history of military exploits – quite the opposite. All in all, destitution and poverty were the norm. There was little to boast of, neither then, nor earlier; little in the way of national heritage or honour to brag about. Except, that is, for one thing: freedom. The Norwegian was free, however poor he might be; and the Norwegian’s freedom was guaranteed in this almost utopian document from 1814, our Constitution. Of course, everything is relative, and what the 19th century saw as a free society would today be deemed to be full of constraints on freedom, and full of subservience. And, as Professor Frank Aarebrot recently reminded us in his marathon televised lecture on Norwegian history, the years of deprivation, when thousands went hungry and there were few opportunities for employment or advancement at home, resulted in emigration on such a scale that Norway lost nearly half its population in the course of the 19th century. It was America that benefited from this exodus of human resources. A constitution alone is not enough. Nevertheless, it brings tangible blessings. It secured the growth of democracy as Norwegian society developed in the 19th century. In 1905, when Norway finally achieved independence, the Constitution acted as a framework within which change could take place, ensuring continuity and legality. And it was of even greater importance for the king and the government in 1940. It served as a guideline for all those who were in confusion or in despair, or simply unsure what to do; it pointed to the principles people should follow in that apparently hopeless situation in an occupied country. When, in his New Year’s Speech at the very beginning of this 200th anniversary year, 2014, King Harald told of how his grandfather, Haakon VII, kept a pocket edition of the Constitution in his breast pocket, over his heart, throughout the Second World War, it was more than just a touching family anecdote. It is a sign of the Constitution’s importance as a statement of basic principles, not just for the one person who ought to know them best – the king, as head of state – but also for everyone who values those precious freedoms and rights it is so easy to take for granted. In this way, nationalism in Norway has taken on board what we might call a more idealistic content than is the case in many countries. Nation-building ideology has been tied to the Constitution and its implications, and as a result national sentiments and national rites and symbols have to a large degree been grafted to democratic and progressive values. We should be thankful for this. And it means that people can, whatever their political opinions, continue to celebrate our National Day and wear their buttonhole emblems and wave the flag and ceremoniously greet each other. And even if nationalism in Norway has had some ugly manifestations, something we cannot deny, we can count ourselves lucky that nationalism in our country is overwhelmingly tied to democratic and inclusive values. Elsewhere, national sentiments and symbols do not always evolve in a similar way. In Germany the situation is different, for obvious historical reasons. Last year I was in Germany on 3rd October, which is the Day of German Unity – to all intents and purposes Germany’s National Day. In accordance with tradition the celebrations ended with a string quartet playing part of the second movement of Haydn’s Emperor String Quartet in C major, Op. 76 no. 3. The same tune is Germany’s national anthem. Haydn lived in the 18th century; moreover, A.H.Hoffmann von Fallersleben, who wrote the words of the national anthem, in 1841, was both a democrat and a radical. The song has been grossly misused in the past, and today one begins at the third verse, with the words “Einigkeit und Recht und Freiheit” (Unity and Justice and Freedom). But it does not help. At any performance of Germany’s national anthem, about a quarter of the audience stay resolutely sitting in their seats. This happened when I was there last year. It was a thought-provoking sight – a small history lesson, one might say: nationalism has had such grim, destructive and monstrous forms in Germany that many people refuse to be tarnished by any of its symbols, even now, so many years afterwards. For many people, the associations it awakens are exclusively negative. Decent people, they argue, should refrain from being touched by these symbols. There is a lesson in all this – that symbols carry the content we put into them. Germany is not alone here. In many countries national symbols, songs and marches awaken unpleasant, or, indeed, embarrassing memories of suppression, imperialism, war and militarism. In the years following the fall of the Berlin wall we have witnessed in Europe a revival of nationalism as a destructive political force. There is a fine line between, on the one hand, a people’s and a nation’s legitimate desire for self-determination and, on the other, the sort of nationalistic chauvinism and intolerance that, at its worst, can escalate into hatred and violence. she’s the flag that flutters in the wind! … there is some fairly extravagant figurative language here and today’s school-leavers – not to mention their parents – would possibly find it difficult to fully identify with it! But once again we must emphasise that this must be understood in its historical context. This song was very much the product of the year of peace. At a time when the ugliest side of nationalism is raising its head in many parts of the world, and malignant forces in our own country Norway are attempting to steal the very concept of the nation and its symbols, it is more important than ever to emphasise that these things belong to everybody. We are all a part of our own nation, and both our country and its history constitute something positive, and they belong to us. What our national symbols, including our music, come to mean for future generations is something these future generations must define for themselves. However, it is up to us to decide what values we, today, invest in our national feelings and in our national symbols. It is also our task to ensure that they are not abducted, that no one pre-empts a monopoly over how they are used, but that they remain symbols for democracy, for a liberal and tolerant state, and for the Constitution that gave them birth. As such, they must be used, and used actively, by everyone. They must be played and sung. Especially in spring. But also when the worst of winter threatens to poison us with its steely ice-cold tongue of hatred, a hatred that can suddenly plunge a Norwegian July into darkness. Then, Wergeland’s words about our country can throw a beam of light over our country. bringing to them your reward!